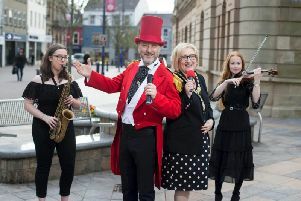 Over 200,000 people gathered over the past ten days to take part in the Foyle Maritime Festival, it has been confirmed. The quayside along the River Foyle was a hive of activity throughout the week as local people and visitors from across Ireland and beyond gathered for the festivities. Alongside the stalls, entertainment and the Clipper fleet, visiting naval vessels, tall ships and a jazz boat were among the key attractions of the festival. Highlights included the spectacular Voyages event on Friday night, which drew one of the biggest crowds ever seen at a public event in the city as thousands packed the quayside to witness the light show and fireworks on the Foyle. The Parade of Sail on Sunday saw people line the city’s Quay to bid farewell to the Clipper Race teams as they slipped lines and set sail for Liverpool for the final stage of their global adventure and the final day of the hugely successful Foyle Maritime Festival. Up to 220,000 people are estimated to have enjoyed the packed programme of nautical themed activities during the Foyle Maritime Festival, which took over the city from July 14-22. Mayor of Derry City & Strabane District Council John Boyle, led the city in waving off the fleet as it made its way back up the Foyle to the official race start at Greencastle in Co Donegal on Sunday. Speaking after the event, he said: “We have welcomed visitors from all over the world over the past week and it has been fantastic to see Derry and the wider North West region profiled in such a positive way on a global platform.